Born on November 30, 1863, Andrés Bonifacio is considered by many to be a national hero of the Philippines. He started the Philippine Revolution, which resulted in the independence of the Philippines from Spanish colonialism. Bonifacio was raised in Tondo, a district of the city of Manila in the Philippines. His family was working-class; his mother worked in a cigarette factory while his father was a tailor and municipal official of Tondo. After the death of both his parents when Bonifacio was just a teenager, he was forced to drop out of school to care for his family. He worked as a messenger, a warehouseman, and even established his own small business where he sold canes and paper fans. Though he had never finished school, Bonifacio was an avid reader, exploring the work of Victor Hugo and Jose Rizal, reading biographies of US Presidents, and reading the Philippine penal and civil codes. Bonifacio was a freemason, and was also a member of the Gran Oriente Espanol, or Grand Spanish Lodge. In 1892, he co-founded the secret society Katipunan. This society encouraged independence from the mother country, Spain, through armed attack. The organizarion had its own structure, law system, and system of government. From the society’s inception, Bonifacio was one of the chief officers, and in 1895, he became Presidente Supremo. Katipunan was dedicated to the development of its surrounding community- it established mutual aid societies, and forms of education for those who would not have been previouslty able to afford it. Katipunan quickly grew in popularity, and by 1896 had more than 30,000 members. It was in this same year that the Spanish colonial authorities became aware of the existence of the secret society, and were considering the steps that should be taken to eradicate it. In the meantime, Bonifacio and the other members of Katipunan were planning how best they would revolt against the Spanish. This was the beginning of the Phillipine revolution, which would last for approximately two years. On August 23, 1896, Bonifacio declared that the Phillippines was independent from Spanish powers. The Spaniards, on the other hand, were ready for the attack- they forced him to move towards the Marikina Mountains. Other groups lead by Emilio Aguinaldo, another Phillippino revolutionary,were able to resist the Spanish and to gain control over some towns. Bonifacio attempted to recruit Bonifacio as part of his group, however, Aguinaldo had him arrested and charged with treason. Bonifacio was convicted by his enemies, and in 1897 was executed. 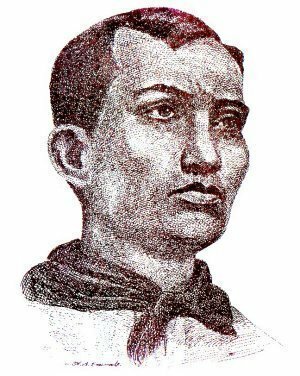 Though Bonifacio’s cause was considered just, it was reasoned that he would have split the rebel forces through his rivalry with Aguinaldo, undermining the strength of the attack against the Spanish. Today, he is remembered for his contribution to Philippine independence and his role in starting the Phillippine revolution.